From an elegant A-line fit for a garden-themed soirée to a curve-hugging fit-and-flare silhouette at a lively brewery bash, real Maggie brides share a glimpse into their big day and what they love most about their gown. Get inspired by these Maggie Sottero Designs styles from real weddings. 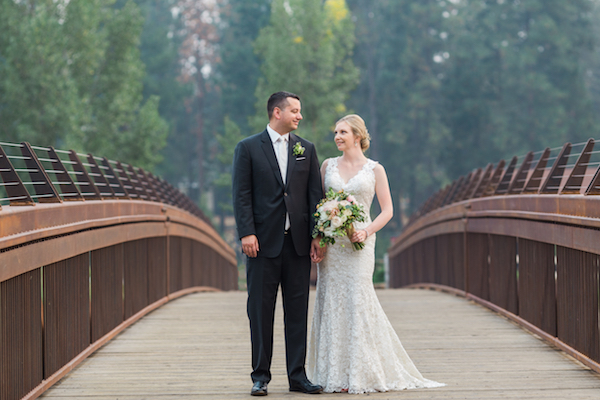 Surrounded by 35 of their closest family and friends, Rochelle and Ben said their own vows overlooking the beautiful brewery grounds and surrounding mountains at the Deschutes Brewery in Bend, Oregon. The couple met in college and spent many evenings enjoying a craft beer or visiting a local brewery. The beer enthusiasts are both from the Bay Area, but Ben popped the question on vacation in Bend and they decided it was the perfect place to tie the knot. "I was in love before I even tried the dress on. I instantly loved the all over lace and light gold undertone. When I put the dress on and saw the double keyhole back I knew 'Hope' was the one. I came out in the dress and everyone’s face lit up because they were also in love! I can’t believe I found my dress during the first appointment, but when you know, you know!" Rochelle said. A bouquet of hops, perfect for a wedding at a brewery. A closer look at the lace bodice on the double keyhole-backed gown. "My husband and I got married on the most beautiful summer day in Alexandria, MN. Both from Fargo, ND, my husband discovered Carlos Creek Winery and we knew the winery would be the perfect place to say, I Do!" bride Haylee said. "From the moment I stepped into my Lisette wedding dress, I never wanted to take it off! It was everything I could have ever imagined for a wedding dress!! It was simply breathtaking. Dancing and running through the vineyard in my dress were two of the highlights from our special day that I will never forget. Thank you Maggie for designing my perfect dress that made me feel beautiful and confident all day long!" Ashley and Mark got married on a beautiful fall day at Villa Parker in Colorado. The Mediterranean estate with its grand entrance and vibrant gardens welcomed their friends and family all from out of state to the mile high city. Ashley's lace sheath gown hugged her curves and featured a plunging illusion neckline and back with beautiful scalloped detail. One of the biggest reasons that Ashley and Mark chose their venue was because it was pet-friendly, so their fur-pup Lulu could be included in the big day! When asked what her favorite wedding moment was, Ashley said, "Saying I do to my best friend with my fur child laying on my gown's train, under the arch my father made." How sweet! Ashley and Mark had recently moved to Colorado before their big day and attributed the success of their wedding to having each other's complete support throughout the planning process. Sara always wanted a romantic garden wedding, but she and her husband agreed that they wanted to share the city they love with their family and friends during their wedding weekend. The Fairmount Park Horticulture Center, a few minutes' drive from downtown Philadelphia, was the perfect choice. Favorite Moment: "It actually happened the day before our wedding, when my husband surprised me with a sweet goldendoodle puppy as a wedding gift! Adding a furry addition to our family definitely gave us something to be excited about after the chaos of the wedding weekend was over." "I found my Sybil dress when visiting a bridal store on a whim with my best friend (and maid of honor). I had already tried on over 20 dresses, but something ‘clicked’ when I put the Sybil on. It felt like the wedding version of my own personal style, and I knew the dramatic floral detailing would be perfect for our venue," Sara said. Sara's floral headpiece perfectly matched her bouquet and her chignon hairstyle allowed the beauty of the back of the gown to shine. Hayley and Alex got engaged by the water at a nearby state park in Connecticut. When they found the Lighthouse Point Park they knew it was the perfect combination of beauty and fun for their wedding day. The couple's venue had a beautiful carousel that was built in 1916 and it was the inspiration behind the whimsical, fun wedding. When asked how she chose her gown Hayley said, "I tried on three dresses and it was the only one that made me cry. I loved it instantly. I 'just knew' Serencia was the one." A closer look at the intricately beaded bodice. Hayley chose vibrant fuschia bridesmaid dresses that perfectly complemented her blush gown and fit the fun vibe of the wedding. Favorite Moment: "Aside from getting married, my favorite moment was probably when we rode the carousel. It was running all night during the reception and we managed to take a moment from dancing and visiting friends to get on. It was so much fun!" This couple had an elegant mountain wedding at Nita Lake Lodge in Whistler, British Columbia. Kyla decided to keep décor to a minimum to complement the beautiful surroundings and allow the natural beauty to shine. A romantic moment alone outside of the rustic venue. The atmosphere was fun, warm and inviting. The bride shows off her gorgeous off-the-shoulder gown while dancing with her dad. We can't help but want to see s'more of this elegant gown. "We were married in beautiful Hubbards, Nova Scotia, Canada. On the most gorgeous fall day!" said bride Rebecca. When asked what her favorite part of her gown was, the bride said, "this Maggie dress was stunning and made me feel like a queen." A closer look at the floral lace detail of Rebecca's fit-and-flare gown.